Every year, the story of Christmas is told and retold, but sometimes the very familiarity of holiday traditions causes us to overlook the vital expressions of this meaningful season. 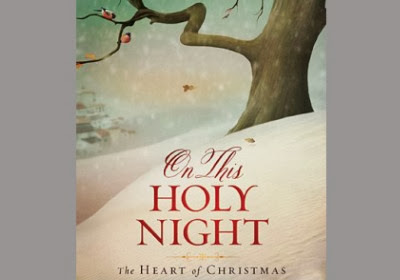 On This Holy Night breathes new life into several aspects of the Christmas story through the voices of six beloved Christian communicators. Sure to connect readers back to the heart of the holiday, this beautiful four-color gift book will be treasured for years to come. NOTE: If you can't see the rafflecopter widget below, please click here to see the widget and enter now. we have been SO BLESSED by your generosity!!! My favorite thing about Christmas is celebrating the Lord's birth , remembering that He came from heaven above and became Man in flesh to be our Saviour to save us from our sins.Getting together with friends and family also . I would like to tread this! Sorry to hear that you're having problems finding the comment box; I'm working with a friend to make it more accessible...thank you for your grace! And thank you so much for letting me know!! This looks like agreat book. Would love to win it! My favorite thing about Christmas is the month of anticipation for Christmas day…helps me to remember that the birth of our Savior was long awaited and anticipated. I am so thankful for God's gift of salvation and grace!! Would love a copy of this book! Merry Christmas ya'll! So love to encourage the hearts of men and women with the hope of Jesus! This resource looks so valuable in making that happen. In these cash strapped times, kindnesses like this make it possible to have a resource when funds aren't available. Thank you! This book sounds absolutely wonderful, especially for a winter read by the Christmas Tree. I love reflecting on Christ's birth and thinking about what Mary felt. What a wonderful gift! Christmas brings HOPE to a dying world. My favorite thing about Christmas is spending time with family and friends celebrating the birth of our Lord and Savior! Reason for the season is "JESUS". Love it! My favourite thing about Christmas is how it draws us to celebrate in our unique customs the love of God for us and how we pass that love onto others. Would love to add this to my Christmas tradition reading!! My favourite thing about Chirstmas is celebrating the Lord's birth, remembering that He came from heaven above and became Man in flesh to be our Saviour to save us from our sins , so that one day we will be with him for eternity. Getting together with friends and family also.